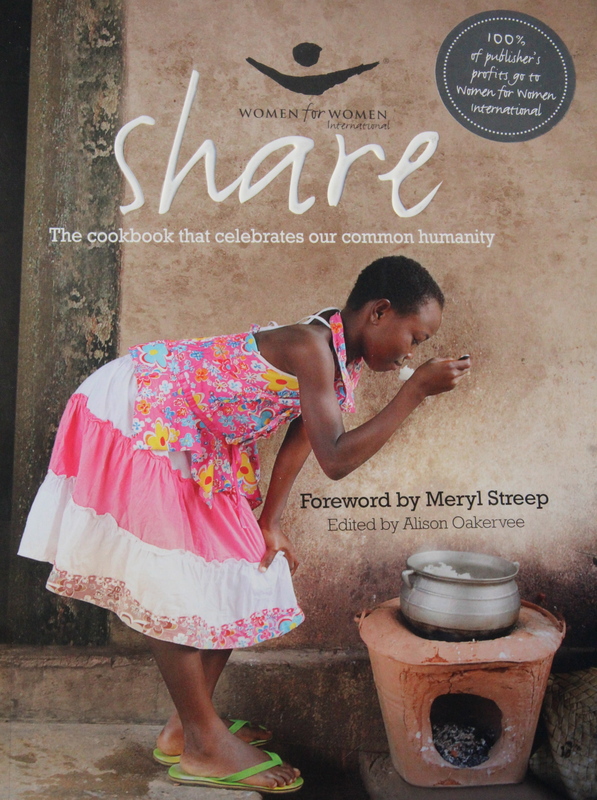 Share: the cookbook that celebrates our common humanity, 256pp. Given the amount of overseas travel we do, I simply had to check this book out of the library, and I plan to buy a copy to support financially Women for Women International (WfWI). This non-profit humanitarian organisation provides practical and moral support to female survivors of war. This cookbook serves several purposes. In addition to being a fundraising tool, it increases WfWI’s exposure to the outside world (I hadn’t heard of it until now). It also showcases recipes from world-class chefs, influential humanitarians, as well as lesser-known heroes and women whose lives have been improved by this charity. Actress, Merle Streep, wrote the foreword, and the page-32 recipe is from Mary McCartney, photographer, vegetarian cookbook author and daughter of Paul and Linda McCartney. Interestingly, there’s a network of women linked to my making of this recipe. My dear friend, Lindsay, and her two sisters spent most of last week at their mum’s bedside. In her mid-90s, Ailsa was dying. Obviously, the only thing I could do to help was cook, so I made two page-32 soups. When I delivered them to Lindsay’s home just before dinnertime on Thursday I learned that her mum had died that afternoon. Heat the oil in a large pan over a medium heat. 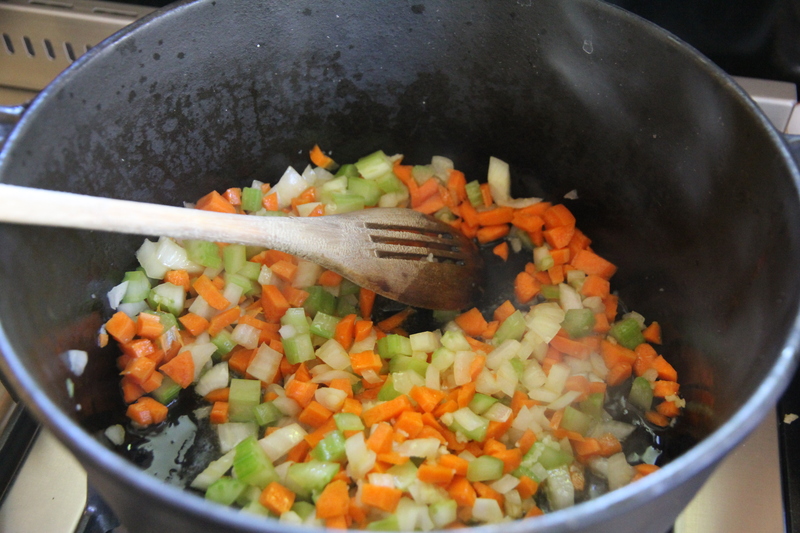 Add the garlic, carrots, onion and celery and gently fry for 5 minutes or until softened but not coloured. 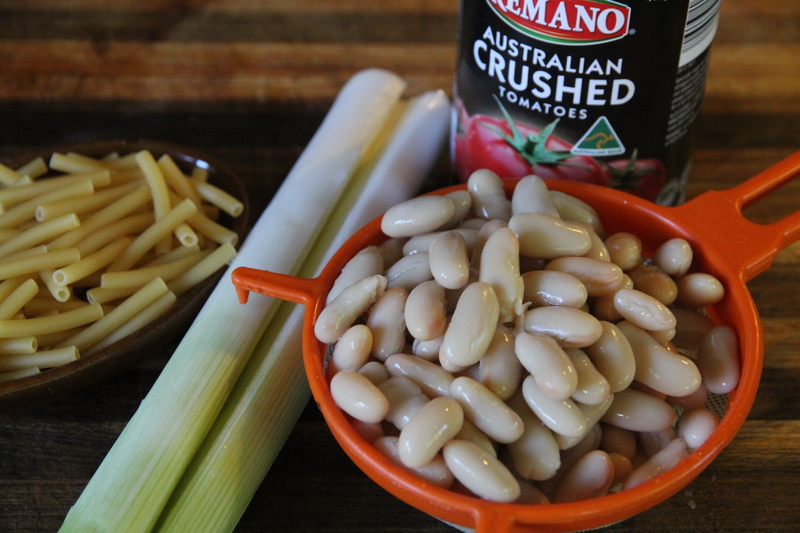 Stir in the beans and the chopped tomatoes, pour in the vegetable stock and add the bay leaf. 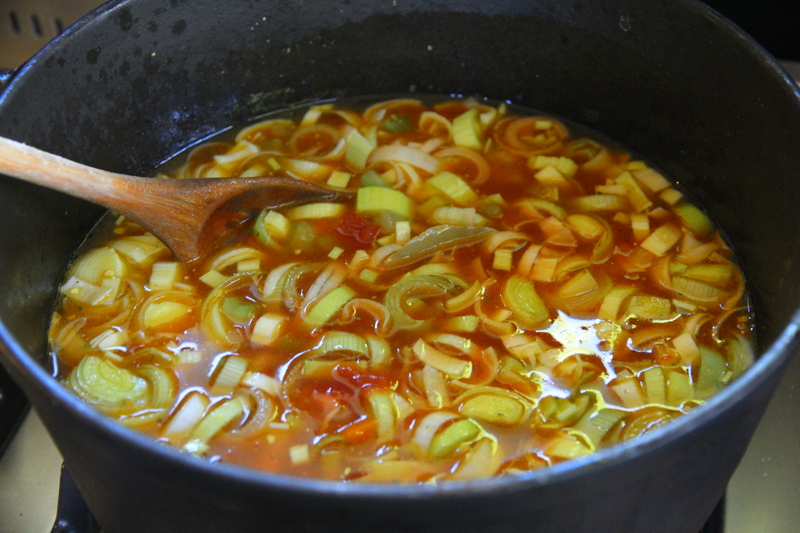 Bring to the boil, then reduce the heat to a simmer and cook for 20 minutes. 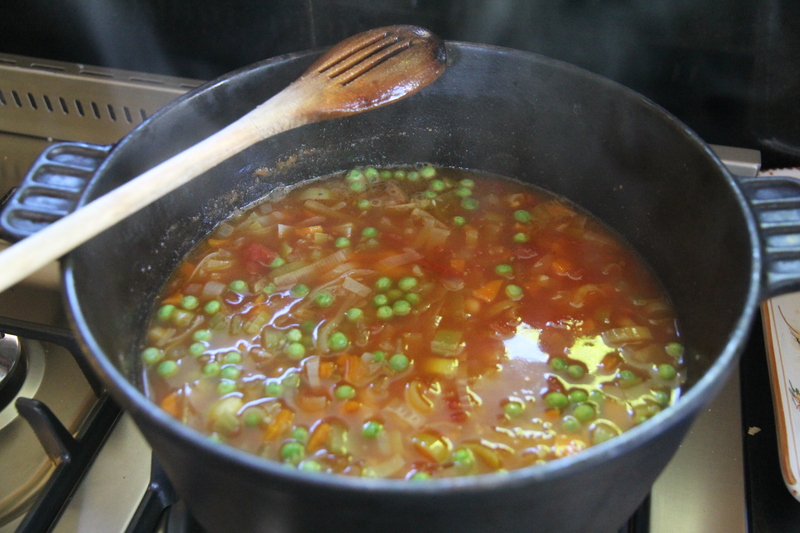 Add the pasta, petit pois or peas and courgette (if using) and simmer for a further 10 minutes, or until the pasta is cooked al dente. Stir in the parsley, season and serve topped with grated Parmesan cheese (if using). Such a bittersweet recipe, and one that I made with a lot of love and sadness. I followed the entire recipe, except for that darned elusive courgette. No matter how many times I looked at the ingredient list, I saw eggplant (or aubergine) instead of courgette (or zucchini). So I bought an eggplant and used it in the photograph. Duh! But as I was chopping vegetables, the word ‘courgette’ hit home. Geez, senior moment! 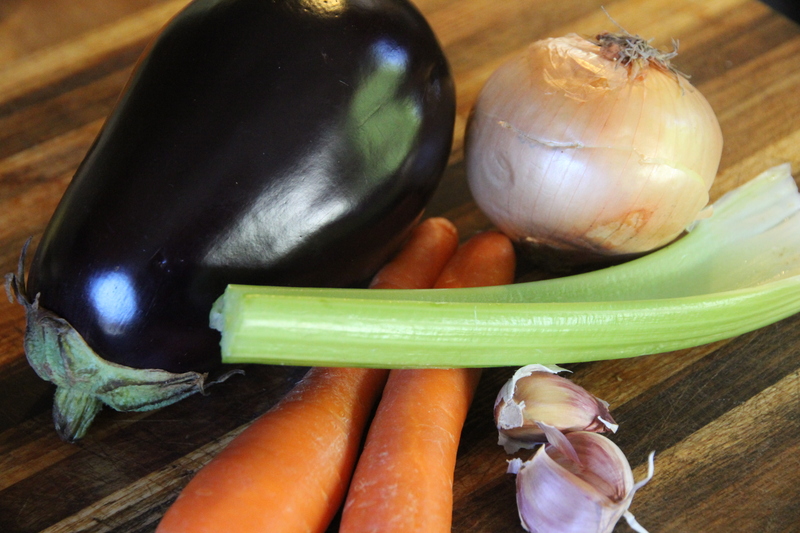 I didn’t have any courgettes so I subbed a leek, which only-just managed to get into a photo. To honour the cookbook’s title, I felt duty-bound to share this recipe. The fact that it was shared with a dear friend and her family in a time of need is especially satisfying. And I happen to know that it tasted good because I sneaked a few spoonsful before delivering it. We head overseas on Wednesday so we’ll be able to attend Ailsa’s funeral on Tuesday. She was a great lady and it will be good to farewell her. 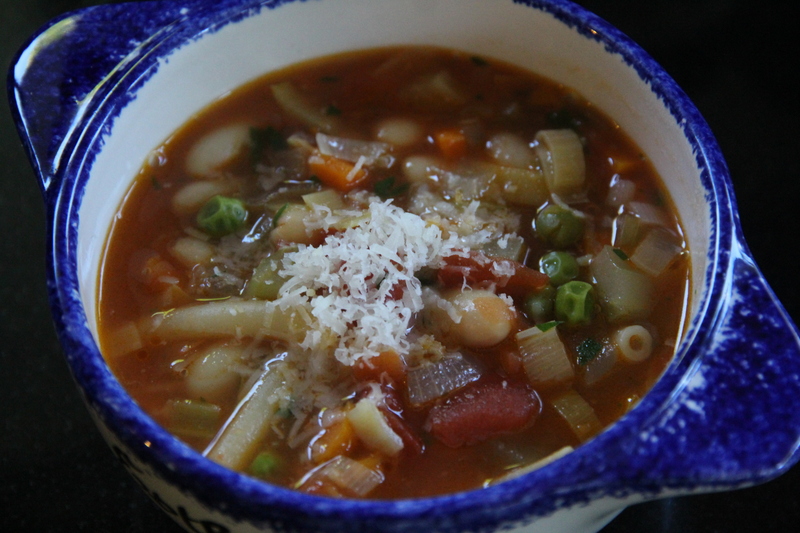 This entry was posted in Light meal, Main dish, Stew/soup, Vegetable, Vegetarian and tagged bay leaf, butter beans, cannellini beans, carrots, celery, courgettes, garlic, macaroni, olive oil, onions, parsley, pasya, peas, petit pois, tomatoes, vegetable stock, zucchini. Bookmark the permalink. Pingback: Are You Curious About A Cookbook That Changes People’s Lives? | What's On The List?